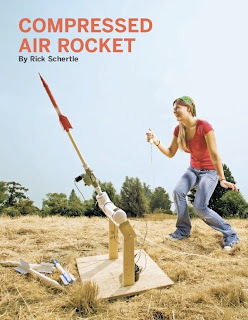 Compressed Air Rocket by Rick Schertle. Page 104. Blow your friends away as you send this 25-cent rocket hundreds of feet in the air. You can build this easy launcher and rocket with common hardware store items in an afternoon. Read Compressed Air Rocket in the MAKE digital edition. And - watching the video, I can't say the results are significantly different from the low cost version. : ) Maybe send a camera up on one of these?